In a town where creativity is a commodity of often fluctuating value, The Bazaar by José Andrés is that rare breakout blockbuster that manages to marry artistic vision with commercial success. The brainchild of James Beard Award winning chef and owner José Andrés, The Bazaar at the chic SLS Hotel at Beverly Hills is truly unique in all aspects: from the innovative concept, to the beautifully designed food and drinks - many showcasing molecular gastronomy - to the breathtaking decor by Phillippe Starck, which pits modern with traditional. The concept is about a fluid 'fantasy'-like dining experience, allowing guests to move through uniquely designed spaces that are true visual treats, while tasting traditional and ultra-modern, innovative tapas (small plates allow for a wider range of samplings!) coupled with cocktails that can be theatrical productions in themselves, with dramatic use of liquid nitrogen and other molecular gastronomy wizardry from a cart wheeled tableside - and desserts again both traditional and those with interpretations all their own. And for those so inclined, add the ability to peruse the eclectic retail displays curated by Moss, integrated into the mix. The Bazaar recently extended their dineLA Restaurant Week to this past Friday (October 29th), and when my friend tipped us off to this - we made reservations immediately for a party of four and left work on time (for once) to meet up there on a weeknight. The $44 dineLA offer featured your choice of one starter and three entrees from the extensive menu of over 40 different tapas, modern and traditional) plus one dessert. Starting out in the "Blanca" or modern side of the dining room, on cream colored sofa style seats around a wooden table - we instantly dove into the task at hand - to narrow down our selections from the extensive (even for dineLA) menu of tapas on offer. Luckily, with a table of four, we were able to get a much broader sampling by taking bites of each other's selections. 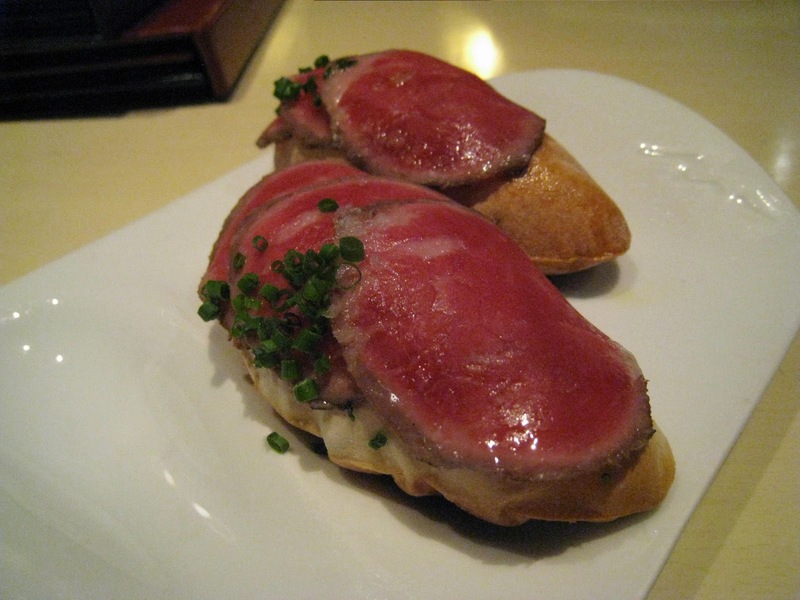 For our four starters, we chose: #1: "Philly Cheesesteak" - airbread, cheddar, Wagyu beef ($8 on regular menu). I had liked the taste of this one from a previous visit - it's every bit as amazing as it sounds, with slices of buttery beef carpaccio layered on top of steaming, fluffy cheese-filled bread. Starter #2: "Japanese Taco" - grilled eel, shiso, wasabi, and chicharron stuffed in thinly sliced cucumber wrappers ($10 on regular menu). 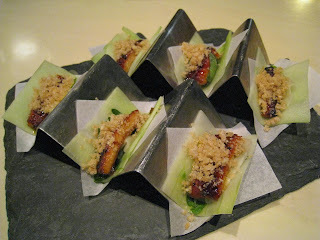 A creative dish that I would not so rashly label 'fusion', but rather, a Japanese inspired reimagining of a Mexican staple - that I truly enjoyed for its perfectly balanced mix of textures(flaky/crunchy/creamy/crispy) and flavors (savory/sweet eel with clean, subtle refreshing cucumber woken up with a small jolt of heat from the wasabi). 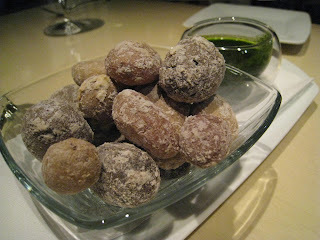 Starter #3: Papas Canarias - salty wrinkled potatoes with mojo verde ($8 on regular menu). This one got mixed reviews - the potatoes themselves looked adorable - like chocolate nuggets rolled in powdered sugar - and tasted AMAZING, served at just the right temperature to bring out its natural flavor, with a perfectly crisped outer layer embellished with a kick of salt. The unfortunate part was the mojo verde dip, which was much too salty for all four of us. We would have loved to report layers of flavor unfolding with the heat of the potato, but we couldn't taste much beyond the salt. 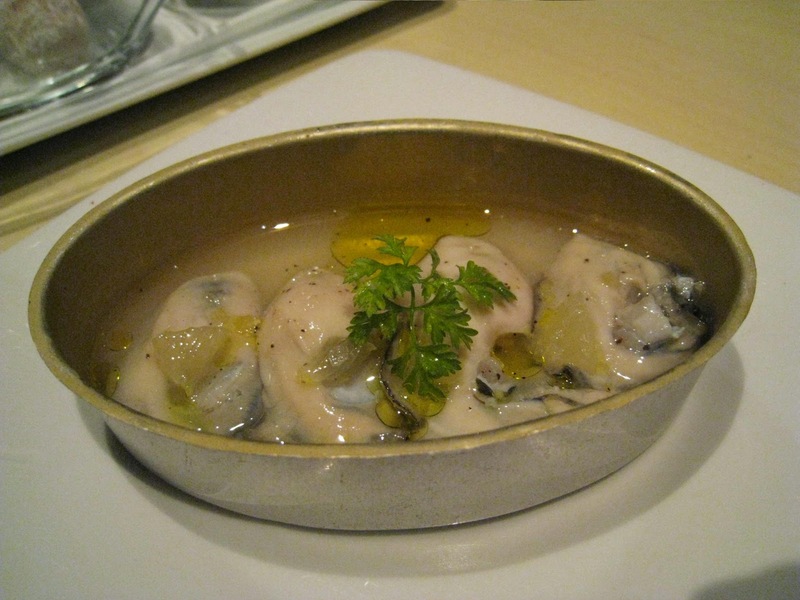 Starter #4: (One that we actually ended up using an entree selection as well, as we all wanted a lot of this one) was West Coast Oysters with lemon and black pepper served in a tin can - in celebration of Spain's great canning tradition ($12 on regular menu). A lovely dish with smooth oysters whose briny-ness was brought out all the more with lemon and black pepper. I am usually a purist with oysters - love the taste of deep ocean in a freshly shucked oyster with nothing on it (especially if they are giant ones from any of the restaurants on the Bay in Monterey!) - but if I were to go for oysters served up with other accompaniments, this was a great choice and gets two cocktail forks up from me. As one of our entrees was taken up by a second helping of West Coast Oysters - the Brussel Sprouts with lemon puree, apricots, grapes, lemon air ($8 on regular menu) would be our second entree. 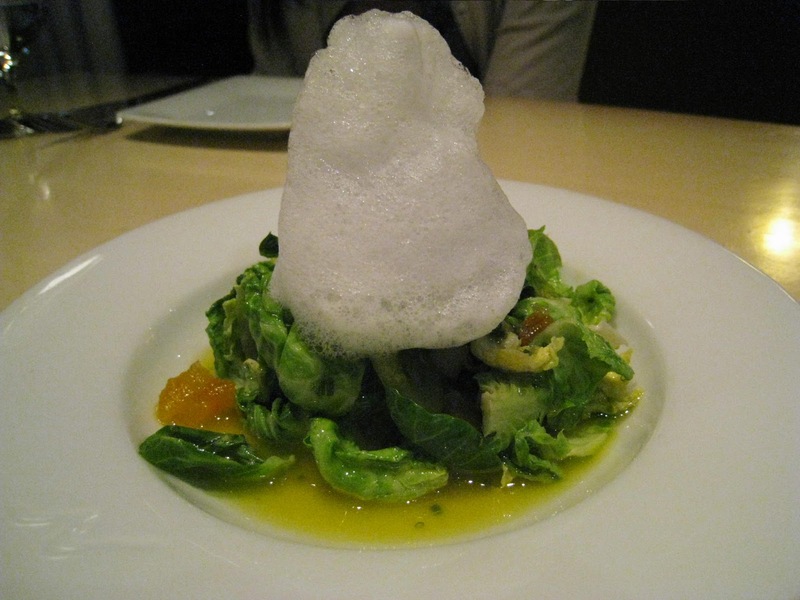 This probably ranks among the top of my favorite dishes for the night - with its original combination of slightly bitter and crisp brussel sprout leaves with the sweet / citrus fruit elements, topped by a dramatic burst of 'lemon air' (foam). I've never really liked brussel sprouts - no, not a relic of childhood trauma, as my parents never served this veggie to us - but I have as an adult found it too bitter, and typical preparations (steamed whole) too dull. But this dish made me a convert - proving that brussel sprouts can be delicious, and exciting to serve! Other entrees which were good, but did not make as dramatic an impression, were: Wild Mushroom Rice with Idiazahal cheese ($10 on regular menu), Croquetas de Pollo - chicken and bechamel fritters ($9 on regular menu), and "Butifarra Senator Moynihan" -Catalan pork sausage, white beans and mushrooms ($12 on regular menu). The chicken filling in the croquetas for some reason tasted like tuna, in consistency and flavor, which was not a bad thing - just, interesting. 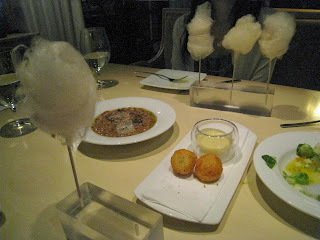 As the only one at the table who had been to The Bazaar previously, I had to have all the ladies try the piece de resistance - Cotton Candy Foie Gras - even if it was off the dineLA menu and had to be added to the tab (not too bad at $5 per person). You simply can't visit The Bazaar without trying this, just for the experience. In taste, you can definitely have much better foie in their Foie Gras quince and toasted brioche sandwiches (plate of 3 sliders) - but it's the concept and presentation that is an experiment not to miss. 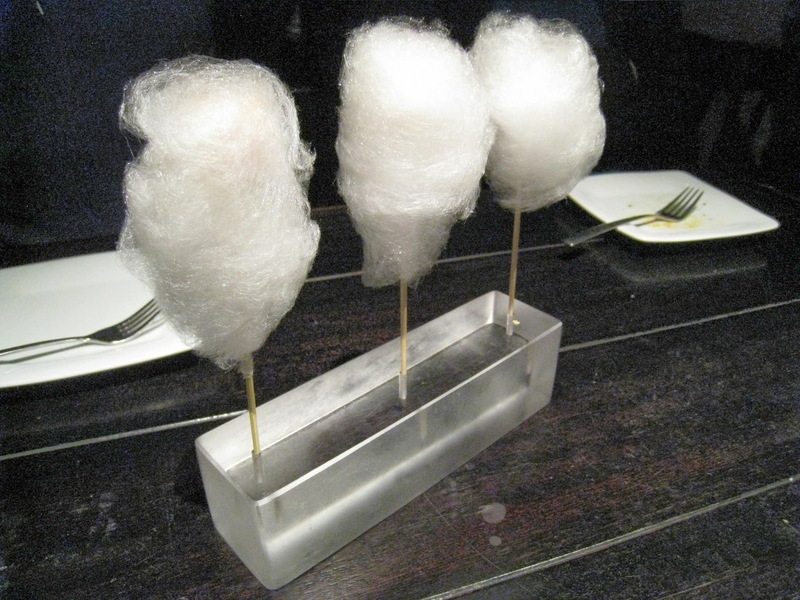 Essentially a block of foie gras is served on a stick, with a cloud of cotton candy wound around it. It's supposed to be consumed like an amuse bouche - all in one bite. A little difficult at first to see how the whole cloud would fit, but the candy of course shrinks down on contact. Definitely a conversation piece - and again the taste is not really for foie connoisseurs, but it is fun and interesting to experience the blend of the creamy, dense, savory block of foie with airy, sugary strands of cotton candy. Back to the mains - we also tried the Jamón Serrano Fermin (not pictured, $16 on regular menu), which was served on two plates with the slices of ham on one, and toasts with a tomato spread on the other. This one was good, but again overshadowed by its more groundbreaking, drama-filled counterparts. 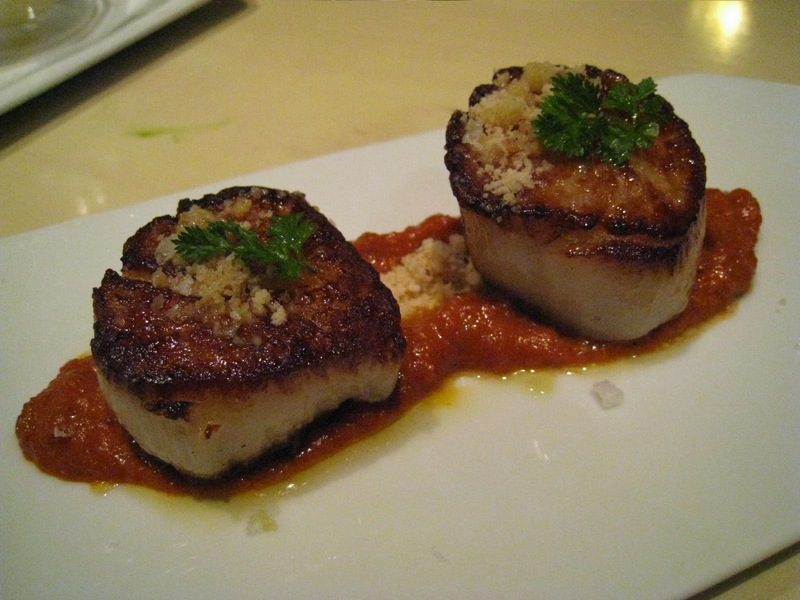 We also tried the Sea Scallops with Romesco Sauce ($14 on regular menu) - the scallops were huge, with a great crispy crust bookending juicy and tender meat inside. Our last main was the Beef Hanger Steak with piquillo pepper confit and natural jus ($12 on regular menu) - though we had a tendency to be more impressed by the creative twists in the modern tapas dishes, it's worth noting that the traditional tapas also exhibited a high level of skill and definitely provided a haute cuisine experience as well. 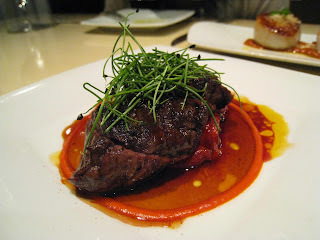 The hanger steak in particular was super tender and juicy, and I loved its simple but lovely plating as well. As we finished with the last of our entrees, our fabulous waitress arranged for a table in The Patisserie space, where we were to move to enjoy our desserts (for those who want to stay in the same space, you are offered the option too, but then you would miss out on the whole concept of the place, and the opportunity to experience the awesome, whimsical space). The Patisserie area features an 'open kitchen' done completely in pink, with an almost Alice in Wonderland / Charlie and the Chocolate Factory tone and feel - the double-decker counter is stacked with ornate glass 'bell jars' of candies and cookies, interspersed with lollipops made of wispy chocolate emblems and tiny, exquisite fine china tea cups and beads. There are hidden gems like a small loveseat whose design looks like a modern take on Marie Antoinette style, built into a glass pillar between The Patisserie and Bar Centro areas, that is a truly romantic and unique space - perfect for a date if you can book this seat. It was too dark for any photos, so you'll just have to experience this space for yourselves! So onto dessert - yes, of course I chose the Greek Yogurt Panna Cotta with apricots and muscat gelatin ($12 on regular menu)! Each layer was a revelation, with apricot puree (sprinkled with crushed pistachios) sitting atop the creamy panna cotta, which sat on top of jello cubes made with moscato wine. Amazing. The other three in our party all ordered the Traditional Spanish Flan with vanilla ice cream and fruit ($12 on regular menu) - which was also incredible. After our meal, it was fun to walk through the designated retail area to the side of The Patisserie, which showcased an eclectic array of goods from the food and travel related, to jewelry and other accessories. The only thing to note for other budget foodies, is that valet parking at the hotel will run you $12 minimum before tip. If you are very lucky, you might be able to find street parking - but it's simply easier, given the location, to just valet park it. Although this season's dineLA is over, the good news is that all of the dishes above are still available (though at higher prices from the regular menu), with many, many other exciting options on offer. If you are looking for a place that will provide a sensory experience like no other in LA - head to The Bazaar. It's perfect for almost every occasion - from a date to girls' night out or happy hour with coworkers (Bar Centro is actually pretty lively, though in a sophisticated way) - to foodies who simply want to celebrate and support culinary creativity, which José Andrés has done an amazing job in demonstrating, is very much alive and well in LA. I for one can't wait to go back, for any occasion at all (and due to budget constraints, I normally don't repeat visits unless the place is amazing)! It is expensive - but SO worth it. Tuna ceviche and avocado roll ($15) - amazing interpretation of classic sushi roll. 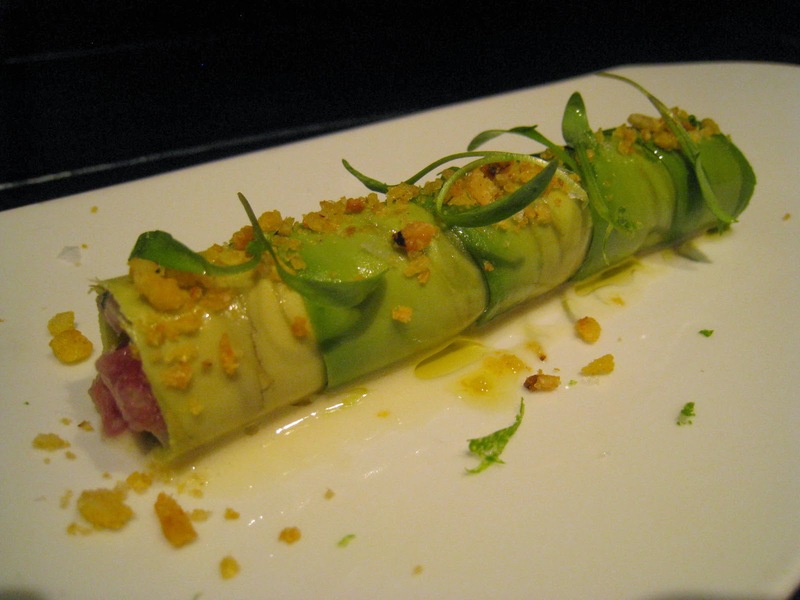 No rice or nori, just the freshest tuna tartare wrapped in incredible, paper-thin slices of avocado! 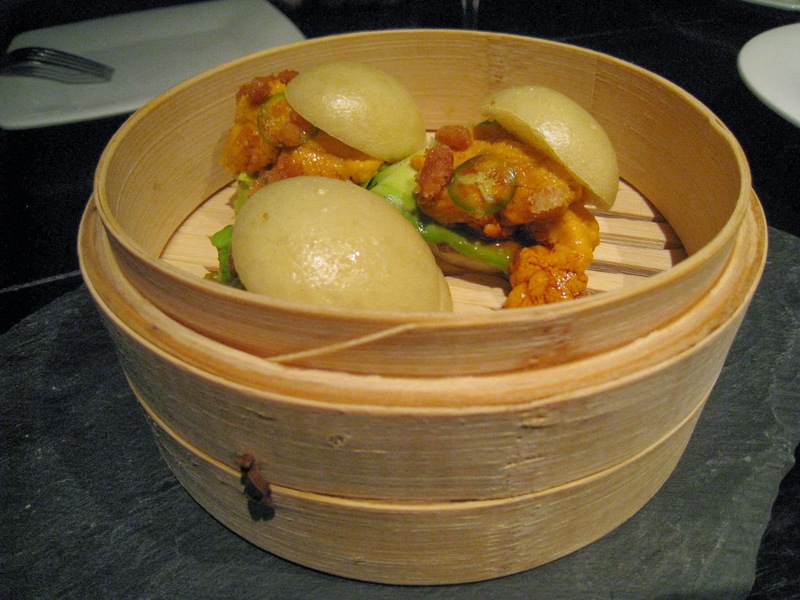 Sea Urchin sandwich with avocado and steamed bun (3 for $12) - LOVE this dish with the briny, nutty flavored sea urchin paired with creamy yet structured slices of avocado and placed in tiny, pillowy little bao! Presentation, in a steamer, is awesome as well. 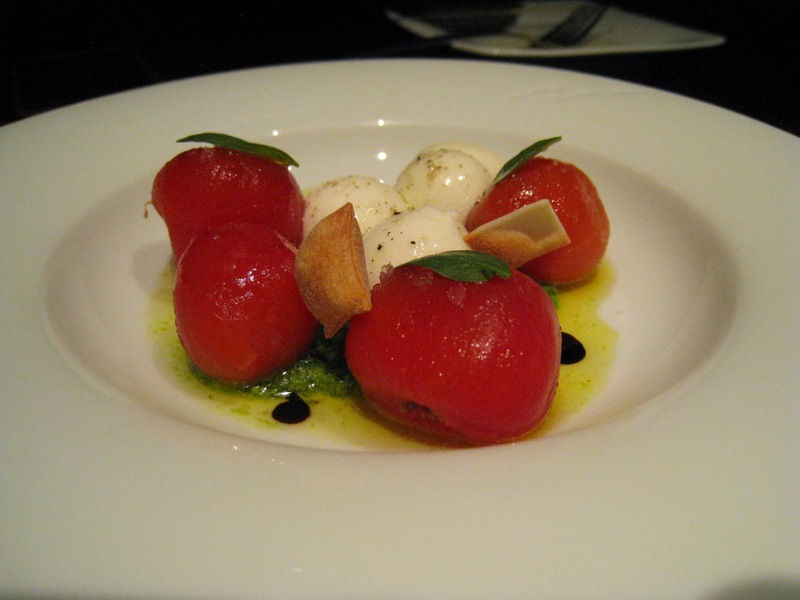 Not your everyday Caprésé with cherry tomatoes, liquid mozzarella ($12) - inventive reconstructed version of the classic Italian insalata. Very good, but not as mind blowing as other dishes at The Bazaar. Foie gras cotton candy ($5 each) - like the Hollywood Walk of Fame, Santa Monica beach and Third Street Promenade, these cubes of foie gras wrapped in cotton candy and served on a stick are like a tourist trap - something you have to bring 'out of towners', like my brother and his wife, to experience on their first visit. 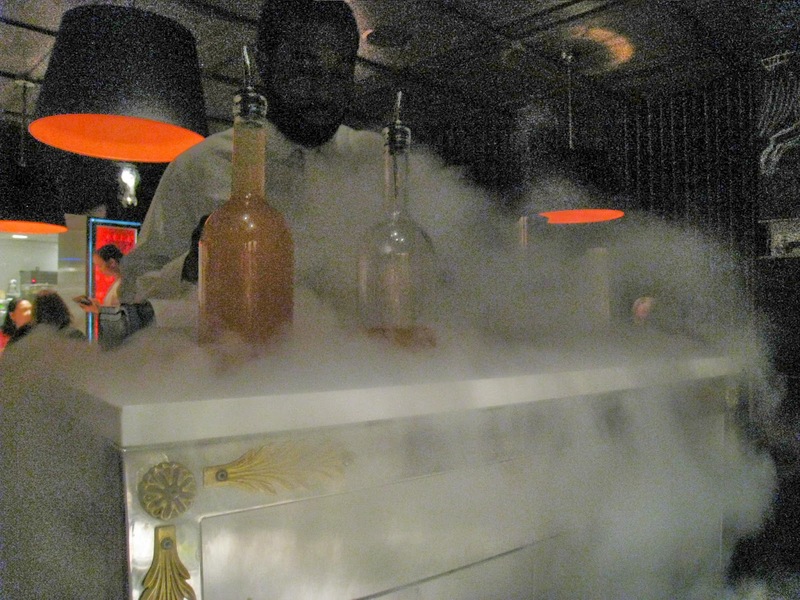 There is always one liquid nitrogen drink on the menu - they wheel a bar cart tableside, then 'freeze' your alcoholic beverage with liquid nitrogen. Deliciously theatrical and entertaining! I forget what the name of the drink was now, but they always rotate the drinks anyway. 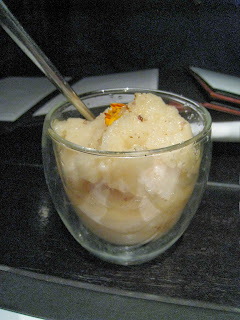 So cool to have to 'spoon' your cocktail - like having an uber upscale slurpy / saved ice that also gives you a nice buzz. dineLA in partnership with sponsor Loews Santa Monica Beach Hotel is offering creative minds a chance to win a mini-staycation and culinary infamy (your roll will, for a month at a sushi restaurant) in the "How You Roll" Contest! Grand prize: One-night stay in luxury guestroom at Loews Santa Monica Beach Hotel and dinner for two in Ocean & Vine's Sushi at Sunset sushi bar. Winning sushi roll will be featured on the menu at Ocean & Vine's Sushi at Sunset bar during the month of December. Limit one (1) entry per person or email address. Must be legal resident of the 50 United States (including the District of Columbia), 18 years of age or older at the time of entry. See Official Rules (at bottom of entry page) for details. While sports fans were preparing for / engrossed in game 6 of MLB playoffs, foodies and local business supporters converged in the bright, airy Cooper Design Space in the heart of downtown's fashion district today for day 1 of Artisanal LA, a celebration of local artisanal food makers, community and economy. 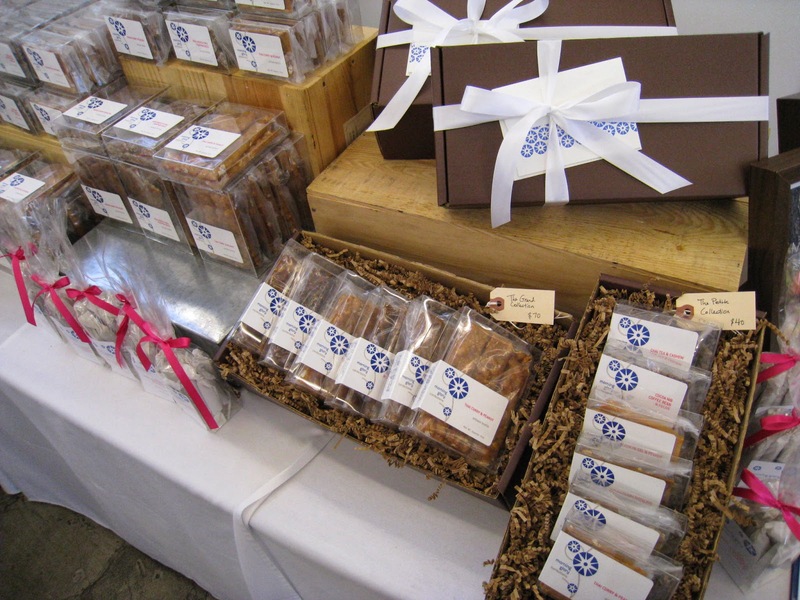 A long-time fan of Compartes and Petrossian, when I saw their names on the vendor/speakers list, I knew the caliber of food makers I could expect at the event - and Artisanal LA didn't disappoint. In this blogger's opinion this inaugural event definitely hit it out of the park - especially for the very reasonable admission price of $10 (advance purchase; $15 cash at the door). 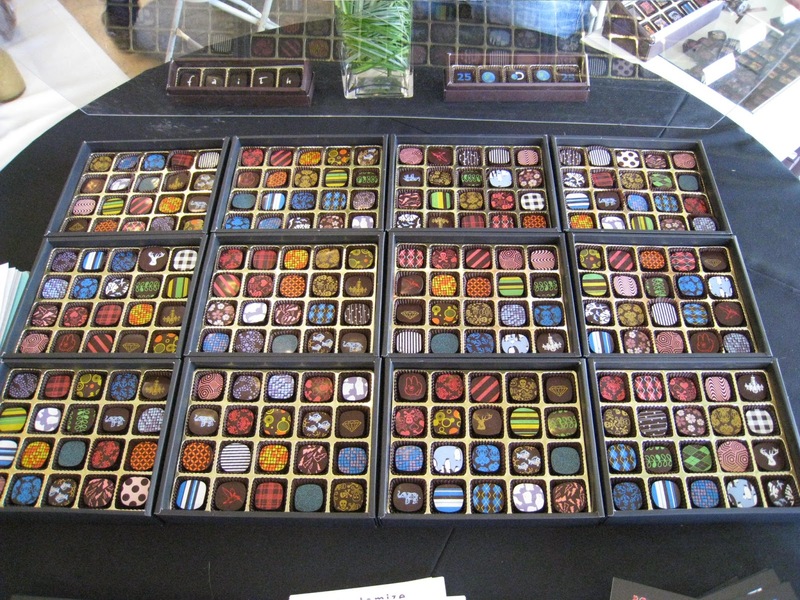 Compartes brought a beautiful display of their chocolate truffles, which you can handpick a custom assortment into gift boxes, as well as chocolate bars ($8) with classic to unique / exotic ingredients from mango and strawberry to orange and pink peppercorns, to candied flowers. Jonathan also presented his new homemade Honey Peanut Butter with Sea Salt, which is amazingly smooth with a lovely kick of salt (as sampled in his peanut butter truffle!). Also on hand were spicy chocolate skull pops ($5), just in time for Halloween. 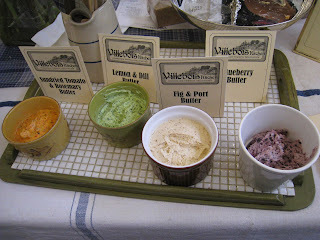 Villebois, purveyor of homemade delicacies, showcased pates and some amazing flavored butters ($7) - Sundried Tomato & Rosemary, Lemon & Dill, Fig & Port, and Blueberry. 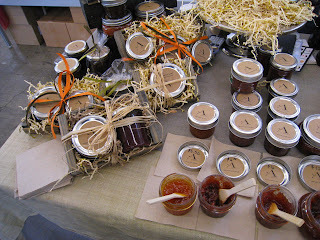 Fig and Port definitely stood out as my favorite - I brought home a tub and doubt it will last through the weekend! Villebois also offered samples of their quiches, and probably had the largest spread of samples at the show. Those who never venture to the Valley need to try the butters at the show - currently, their products are not widely available at retail and just sold through one location in Burbank. 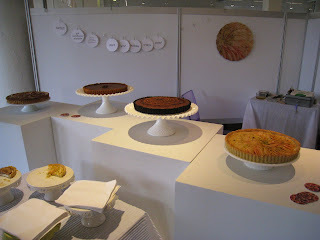 Tartist had a streamlined booth, the better to highlight four of their tarts. 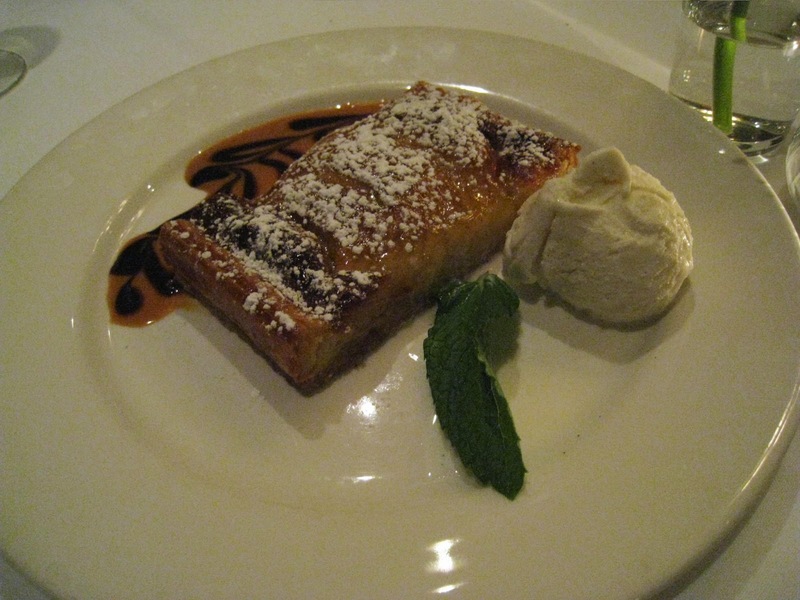 I especially loved the apple tart with the creative touches of rose water, persian honey-vinegar glaze and sprinkling of pistachio, on mascarpone in a french crust ($35 for 10" fruit tart regularly, discount given at event). DON'T MISS trying this at the show - Tartist isn't available at retail and owner Xarene produces to order only. She makes these tarts from fruit in her own and friends' gardens right here in LA, but can also make them with fruits from your own tree on request! 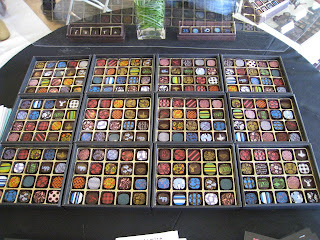 Another best-in-show flavor discovery was at Morning Glory Confections - with their unique handmade candy items from fusion brittle with flavors like Thai Curry Peanut (the tasting curveball of the show - it tastes like regular brittle at first, then surprises with a great kick of spice when you least expect it $5 small box, $10 big) and New Mexico Chili and Pumpkin Seed to their sea salt caramels made with Bacon Fat, Smoke Spanish Paprika and Fleur de Sel! 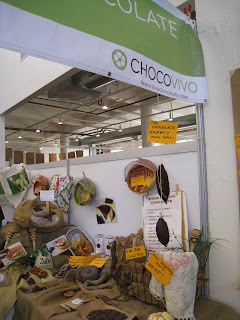 ChocoVivo offered hand stone-ground 'whole bean' dark chocolate bars - that are handmade, natural, and dairy-free with no milk powder, soy lecithin or additional cacao butter!!! My favorite out of the ones sampled was Coffee & Vanilla. They also offer hot chocolate mix ($16) that is dairy free - a rare find! - in flavors like Vanilla Bean and Mayan Traditional. You can of course make it with milk if you like, but this mix is a dream come true for the lactose intolerant - you can also make it with soy milk or rice milk. Greenbar Collective/ Tru Organic Spirits offered up organic liquers infused with flavors from Orange to Jasmine and Hibiscus which held the right balance for me - not overwhelmingly fruity/sweet or floral. They are working on getting these into bars everywhere, but for now, I'm told Tru Organic spirits and liquers are served at Geisha House! In addition to vendor booths, there were also talks and demos throughout the day - the two MVPs for me were: (1) "Christopher Klapp, (GM of) Petrossian, about Sustainable Caviar" - very informative about the process of harvesting and pricing caviar, and how to serve and taste it. 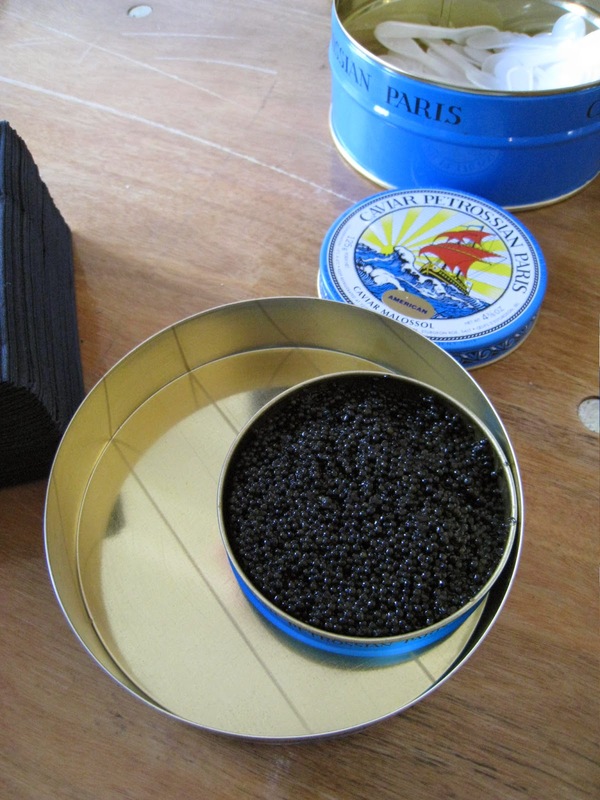 Followed of course by a tasting of 5 caviars from Trout and Salmon Roe to a cubed sturgeon caviar! 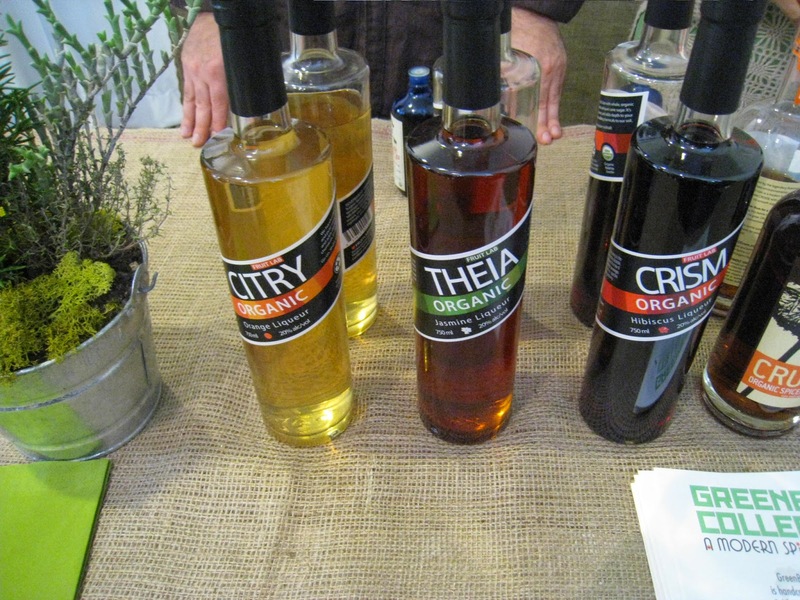 This tasting alone was worth the $10 admission fee (to the Artisan LA event - there wasn't any extra charge for the talk or tasting!!!). (2) "Lindy & Grundy, Heritage Meats and Home Butchering with Marissa Guggianna, Author of Primal Cuts" - somewhat out of left field, but in a good way! 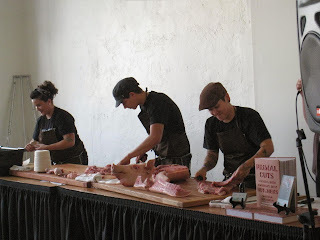 The team non-chalantly brought out an entire pig, and gave a live demonstration of how to butcher it to get pork chops, sirloin, roast, bacon etc.! I'd never seen it done in person before and it was an interesting thing to watch, especially in the penthouse space in fashion district! Coming off the excitement of the talks/demos, had to stop by Akasha's table - I had great meals at the restaurant in Culver City, and was interested to see what they had brought to the show. Spread over the length of the table were jars of various organic jams, preserves and chutneys with flavors ranging from apple-quince to berry-rhubarb-ginger (~$6-$8 for small jars) - all of which tasted amazing. I went home with a jar of the apple-quince. Chef Ricardo Zarate of Mo-chica fame, and who has set food writers abuzz with Test Kitchen, was on hand with his Anticucho tomato-less bbq sauce with Peruvian spices - also incredible. Lastly, courtesy of the LAUSD School Garden Programs (a portion of proceeds from Artisanal LA will go towards this program, which supports a garden in every school in order to create opportunities for kids to discover fresh food and healthier food choices), guests can take home individual herb seedlings of their choice to start their own garden. 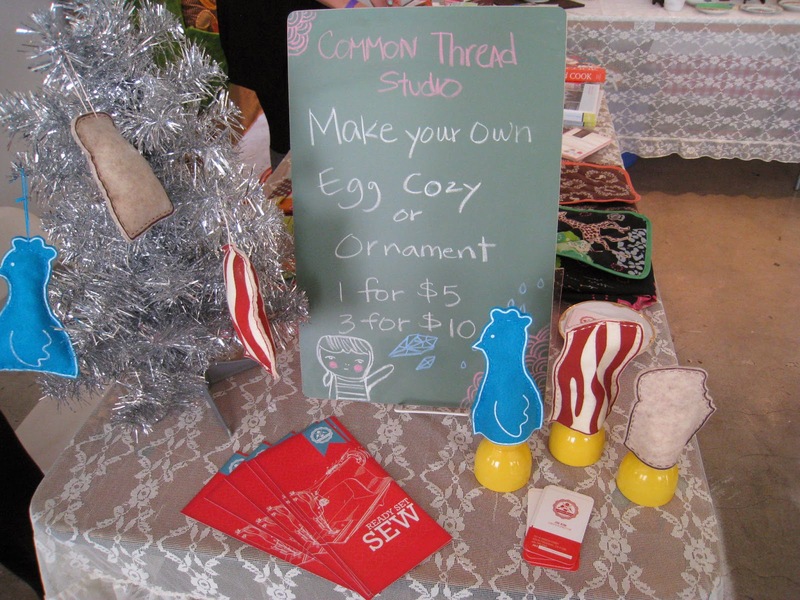 For those who are crafty - there was also a DIY booth by Common Thread Studio, where you can sew your own felt egg cozy (or close the bottom and stuff it to turn it into an ornament). The designs were adorable, but it will cost you $5 for 1 and $10 for 3. All in all, there is plenty to see, do, and taste for everyone at the show, which goes into its second and final day for this season tomorrow. Raffle: Don't forget to drop off your raffle ticket stub at the table immediately to your right as you enter the show space, for your chance to win prizes throughout the event! Drawings are to take place every 15 minutes, I was told - but it was a little hard to hear them call out the numbers sometimes with all the background noise. You can go up to the table at anytime to ask them to check your ticket against the winning numbers that have been drawn. Going Back for Seconds: Your admission fee is good for unlimited re-entry - both days! Those who attended today can go back tomorrow without paying another cent for admission. Just bring back your wristband. Easiest and safest, but not the cheapest: Cooper Building has an underground parking garage that's superconvenient, as you can take the elevators right up to the building and then to the event space on the 11th floor, but it will cost you - Artisanal's site says $10, but the sign at the garage entrance says $8 (flat rate). If you parked here - comment and let the rest of us know which is right! Short walk, less secure, but dirt cheap (for downtown): Aside from the lots mentioned on the event site on Santee Alley, there are also some on Los Angeles St between 6th and 7th Streets: the first one is $4, second one for $3, both flat rate, both outdoor (first one is roof parking, not sure about the second). Seems safe enough for daytime parking. There is also a street level outdoor lot on 7th for $3 flat (if you were going south on Los Angeles St, make a right on 7th and it will be on your right). Looking forward to the next event in Winter 2011! Never thought I'd say this - but I've been eating out so much recently that it's been hard to get caught up with the reviews! Anyways, this one is too late to affect those weighing their options for dineLA - but thought it would be worth capturing our experience here anyway. We decided on Palate Food+Wine as we needed a venue close to work for a weeknight outing, and the place had received hearty endorsements from several foodie friends, as well as "Miss Sassy's piloxing instructor. 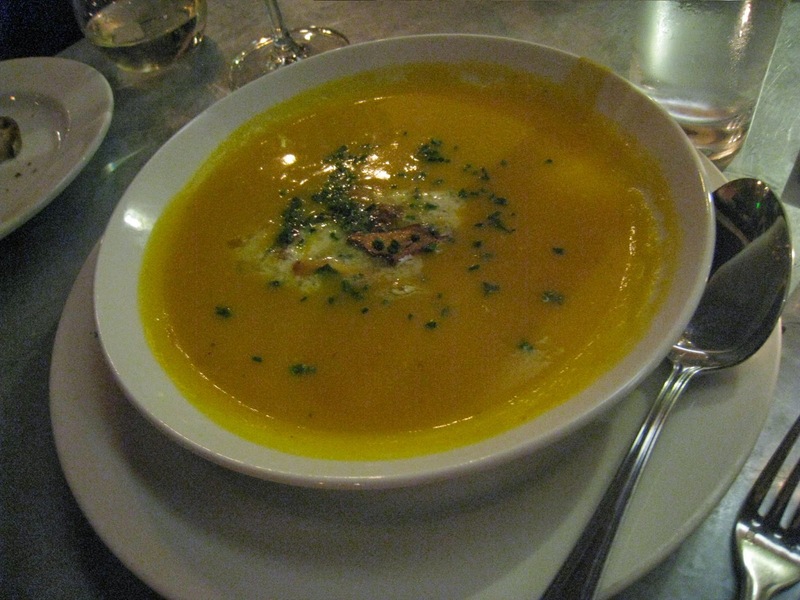 Unfortunately, despite the rave reviews (of their regular offerings), Palate's $34 dineLA menu and spotty service proved to be disappointing. Located on a stretch of Brand Blvd occupied by mainly office buildings, auto and car parts dealers, Palate's exterior was not initially impressive. However, the much talked about fun back dining room with its racks of wine and bar did have character. We were seated directly below a window with a view into the cheese / fruit prep room with chic marble surfaces - where we could see a sous-chef, er, cutting the cheese...all night. The menus were printed on loose leaf paper clipped into green legal folders...not sure how this fit with the theme, but we shifted our attention quickly to the wine list, eager to kick off the evening. Of the three of us who ordered wine - two were unpleasantly surprised by the small serving size of the alleged 12oz glass, and the third received bits of cork in her 'decanter' (used to 'rest' her white wine before pouring into her wine glass, complete with cork shrapnel). Our server made no attempt to explain the portions nor to replace the cork-filled glass. Despite the faulty start, we were hopeful we would fare better with the food. Two in our party started out with the Tahitian squash soup with chanterelles, bacon, crème fraîche and chives. The mix of ingredients sounded incredibly alluring - and aside from being a tad too salty, it was flavorful and appropriately creamy - and probably ended up being the best dish of the night. Fancying myself a bit of a culinary adventurer, I will almost always opt for the unfamiliar dish or one that no one else wants to try. 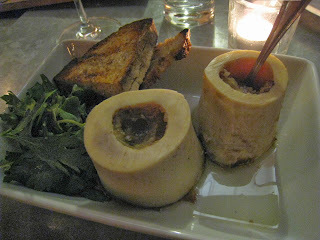 So for my starter, I chose the Roasted Bone Marrow with grilled toast, capers + parsley salad. Up until that evening, I had only tasted (and LOVE) stir-fried bone marrow cooked Chinese style with the pieces in white cylindrical shapes that almost resembles filled tube pasta. With that disclaimer, that I do not have any frame of reference or basis for comparisan, I thought Palate's interpretation was a little too oily. 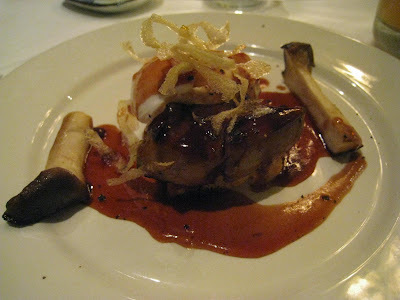 The plating was interesting, with the marrow served up in two pieces of vertebrae. I didn't enjoy the oiliness nor the consistency of the marrow, which reminded me of lard except not as heavy or solid, and is semi-transparent. There wasn't much flavor either. I'm told this is the way roasted bone marrow is supposed to be - so perhaps it was great, and I just didn't have the appreciation for it. 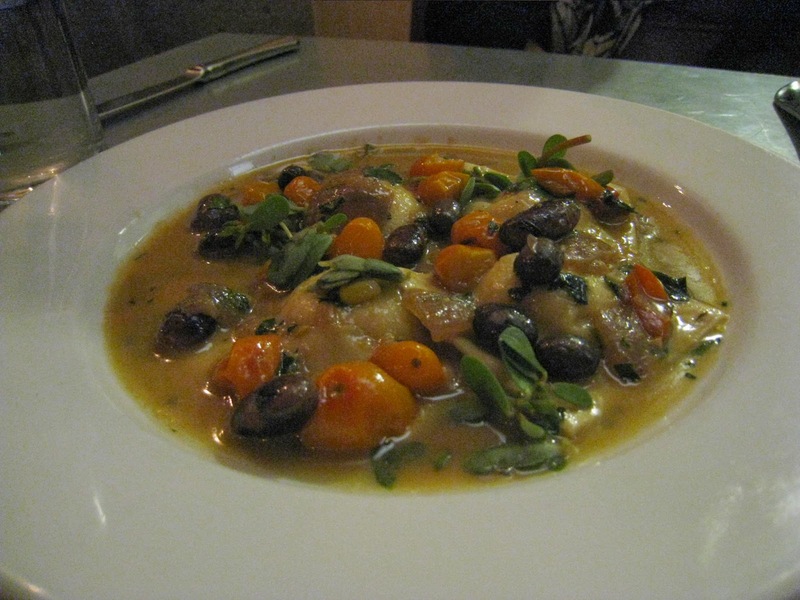 For the main dish, two in our party ordered from the regular menu - the Vegetable Ravioli - and unanimously ruled the dish 'all salt'. No other flavors came through...at this stage, we were starting to see a theme emerge for the evening. 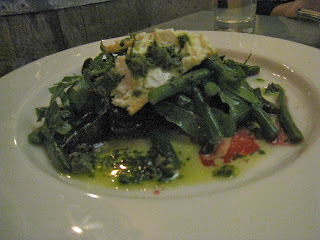 As a side dish, the same two people also gave the Beetroot Salad with haricot vert, ricotta salata, chickpea purée and pickled carrots a try - again only a single note came up: salty. We must have picked the wrong night - with a chef that is heavy-handed with the one particular seasoning! For my entree, I went with the only seafood dish available from the dineLA menu: Loup du Mer (sea bass) with cavolo nero and sunchokes. 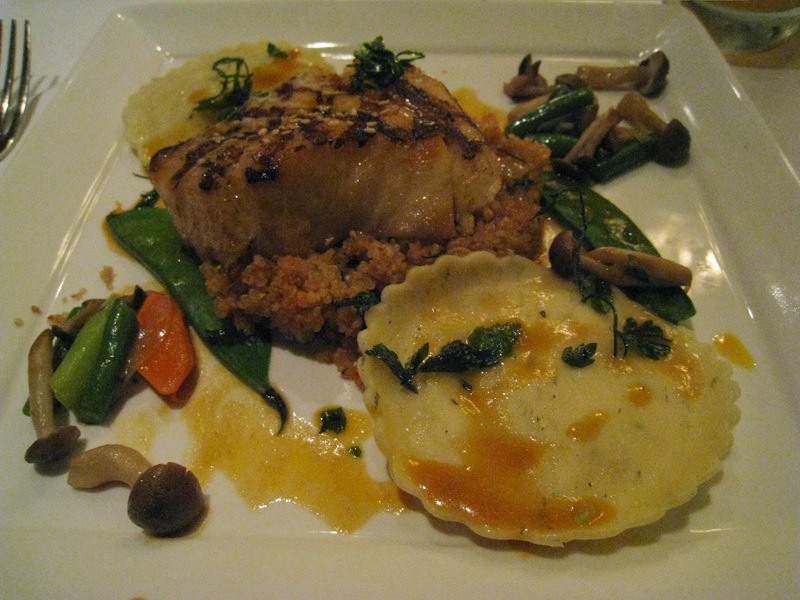 The fish was a bit overcooked, and the filet was cut a bit too thin so that the crisp, salty skin completely overwhelmed the texture and expected fresh, natural flavor of the fish. And this dish too, did not escape from the chef's bottomless salt grinder. Our fourth friend ordered the Short Ribs with pomme purée, wild broccoli, baby onions and horseradish crème fraîche (not pictured as the room and dish were both too dark for photography). So as not to break the streak - this dish was also lackluster, with the only taste that broke through, you guessed it - salt. Thoroughly disappointed in the savory dishes, we hoped dessert would help salvage the night. Us two dineLA diners chose the Hazelnut Panna Cotta with pomegranate and grapes. Those who have read my previous reviews know Panna Cotta is one of my favorite desserts - and I really tried desperately to like Palate's (by this point, it was somewhat a matter of personal pride / vanity to find some good in the meal, as I was the one who ultimately pushed for us to dine at Palate!). Despite my best efforts, I could not bring myself to go beyond the first spoonful. 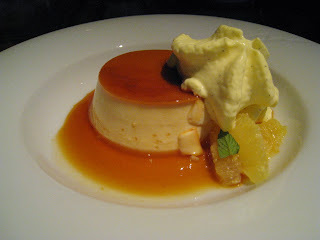 The panna cotta tasted like styrofoam-flavored Jello from a box - thin, watery and gelatinous. It sat in a pool of what we initially thought would be some sort of exquisite emulsion made from grapes and pomegranates - but soon realized must have been recycled dishwater. 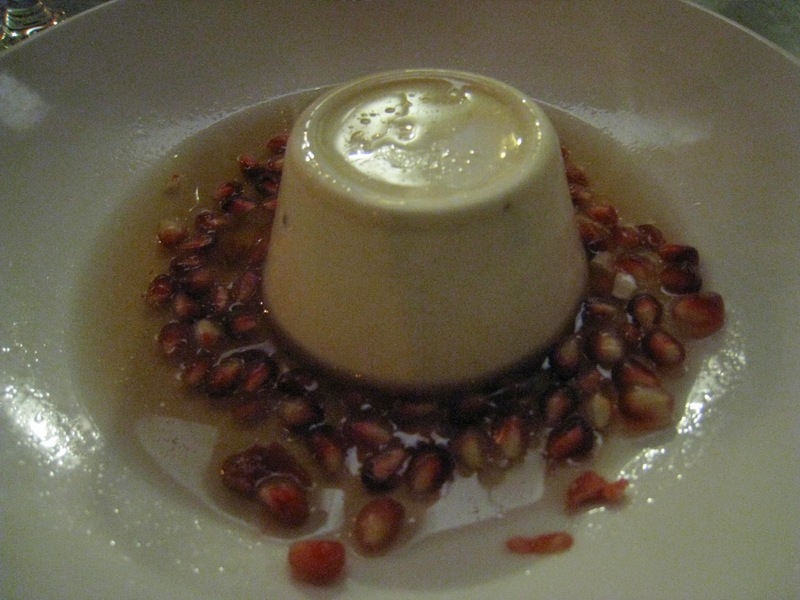 The pomegranate seeds randomly strewn on the plate, I get IN CONCEPT were supposed to add tartness and crunch to counterbalance the - in concept - subtle hazelnut flavor in the creamy panna cotta - but they served neither purpose in execution. The 'dishwater' soaked seeds did not hold a crunch, and, like the panna cotta, were completely flavorless. All in all, I can safely say none of the ladies in our party will return to Palate - unless someone else is footing the bill, and we have personal guarantees of the quality of the exact dishes we would be served. I know this may be a bit hasty, as afterall we had not tried much on the regular menu, and the place comes highly recommended from food critics and friends alike...but our experience, fresh on our minds, is too difficult to get over at least in the short term. And there are still so many other great restaurants in LA I need to try - with my meager funds, and now tainted reputation with this particular set of friends - I'd rather not take a risk on Palate again...sorry! Aside from Petrossian, Maison Akira was the restaurant I was most excited to check out during dineLA Restaurant Week, based on the menu (foie gras and truffle in the starter, sea bass, king crab and lobster in the entree, and an interesting sounding 'nougat glacee'), impressive credentials of Chef Akira Hirose (who studied under Joel Robuchon and worked at L'Orangerie, the Ritz and the Penninsula), and the website (looked very refined, an elegant setting to house true haute cuisine). It seemed like a sure bet at 'only' $44 - so I asked "Designer" to come along on a Thursday night, thinking it would be a great way to finish off this round of dineLA. On arrival, it was clear the venue would not exactly align with the look and feel effused by the website - on a small street off the far end of Colorado, past the main strip of restaurants and shops, Maison Akira is in an unassuming red brick building several doors down from "Sushi of Naples" (a hybrid sushi restaurant / sports bar offering all night happy hour and a rowdy crowd). Stepping inside, the decor felt stale, a little French countryside with - in Designer's words - a hint of "Solvang". The main dining room was tightly packed with tables, with a red tapestry print curtain on the back wall loosely drawn over a floor to ceiling mirror typical seen in small hole-in-the-wall venues to make the room appear larger. A stained glass piece featuring a cottage hung on one wall - those are perhaps the main elements that made the space feel so "Solvang". Brushing perceptions of the decor aside, we remained hopeful the meal would be fantastic, given the mouth-watering descriptions and the impressive pedigree of Chef Akira Hirose, and the fact that the restaurant was filled to capacity on a Thursday night. ﻿We were happy to see at the top of our dineLA menu that the prix fixe deal would be offered through Sunday October 17th - we could come back on the weekend to check out the dishes we didn't order that night (and perhaps even add the wine pairings for an extra $24)! 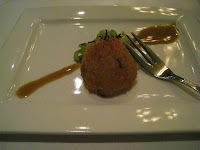 After placing our orders, we were presented with an amuse bouche - a single arancini with vegetable slaw and balsamic emulsion. The risotto was bland, but we overlooked that as it was afterall free, and kept an open mind for the upcoming three course dinner. "Designer" was also off to a happy start with her Pomegranate Kir Royale - a great and fruity variation of the classic cocktail. ﻿The dineLA starter I selected of course had me before I even set foot in the restaurant - Grilled Duck Foie Gras and Poached Free Range Egg on Toasted Brioche in a Port wine Truffle Sauce. As this offered the best 'fine dining' experience of the starters, Designer also ordered this for her appetizer. Foie Gras is often tricky to get just right - you can overwhelm the already rich texture and flavor by oversearing the steak to give it a too thick/pungent 'crust', or serve it either too hot (causing it to lose structure) or too cold (not bringing out the flavors enough). Maison Akira gets it right, serving the foie at just the right temperature to bring out its rich flavors, and grilling it just enough to give a slightly crisp outer layer, nicely offsetting the creamy interior. It was all beautifully plated as well. My only minor notes are about the accompaniments - the poached egg felt a little loose and unstructured, and the yolk did not have a lot of natural flavor. The brioche also could have been served at a slightly warmer temperature (to work more cohesively with the warm foie and egg instead of being a mildly distracting cooler afterthought). Overall though, as the foie is the central focus, and was well executed, I would give this dish a high ranking for the meal. ﻿Designer and I both chose the same entree - Duo of Miso Marinated Chilean Sea Bass & King Crab Ravioli in a Lobster Emulsion. We were ready to be blown away - but unfortunately the fish was unevenly cooked (overcooked in some places and undercooked in others), the ravioli was dry and relatively flavorless, with a thick and too-chewy wrapper that didn't taste freshly hand-crafted, and the King Crab in such small pieces that you couldn't discern whether it was fresh, or to relish its flavor. The Lobster emulsion was a light drizzle and we could not really taste it (the ravioli definitely could have used more liquids). The quinoa sitting underneath the sea bass was a saving grace, infused with flavor and with an even al dente consistency. We were surprised by the entree, which should have been the crowning piece of the meal - but perhaps the chef was having an 'off' night. ﻿For dessert, Designer and I finally decided to diverge. She ordered the Warm Apple Tarte with Caramel Sauce & Vanilla Bean Ice Cream. The apples tasted fresh and the ice cream smooth with specs of real vanilla bean - but the tarte could have been served at a hotter temperature to tease out the apple / cinnamon flavors more intensely - and the pastry was a bit hard to cut through, where we had expected a buttery, flaky, warm crust to showcase the fruit. ﻿﻿I went with the Nougat Glacée in a Raspberry Sauce, as the Ile Flotant just sounded like a meringue drowned in sauce - and I'm always down to try anything I am not familiar with. 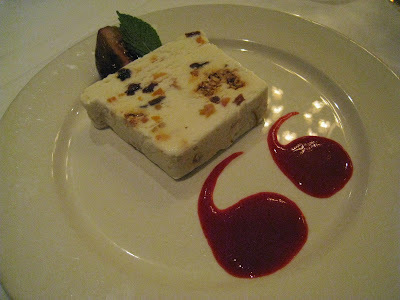 The Nougat Glacee turned out to be one of the most originally presented and delicious desserts I've had in LA. The ice cream is shaped into a slab resembling a piece of nougat candy, riddled with fruit and nuts throughout. The balance of smooth ice cream with crunchy candied nuts and sweet, chewy dates was perfect. You could then dip spoonfuls of this mix in the raspberry sauce or eat it with the poached fig on the plate to add more fruity flavor / another burst of subtle sweetness. 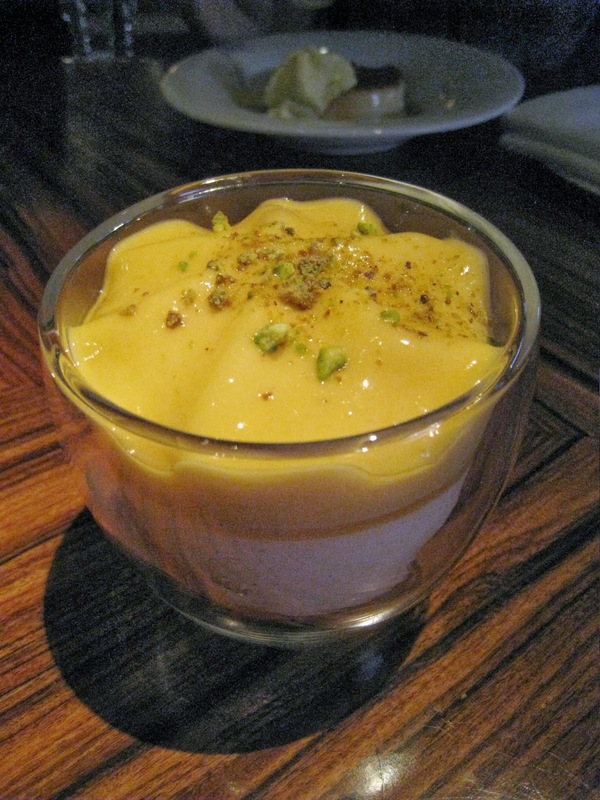 This dessert was lovely, light and refreshing after the relatively heavy meal. All in all - the 'sure bet' turned out to be a bit of a gamble - luckily "Designer" is a close friend who doesn't mind experimenting with new places with me, otherwise, anyone looking to bring a guest they are trying to impress would be taking a risk with some elements of the experience. Maison Akira was good in three areas - starter, dessert and attentive service. The two outliers were decor and the entree - if you and your guest don't put so much focus on ambience as part of the overall experience, you'd be fine - but as dining is a about the holistic experience for me, Maison Akira is not at the moment a place I would personally trek out to Pasadena to make an evening of. If I happen to be in the area already, then I may stop by for a drink and foie or dessert. 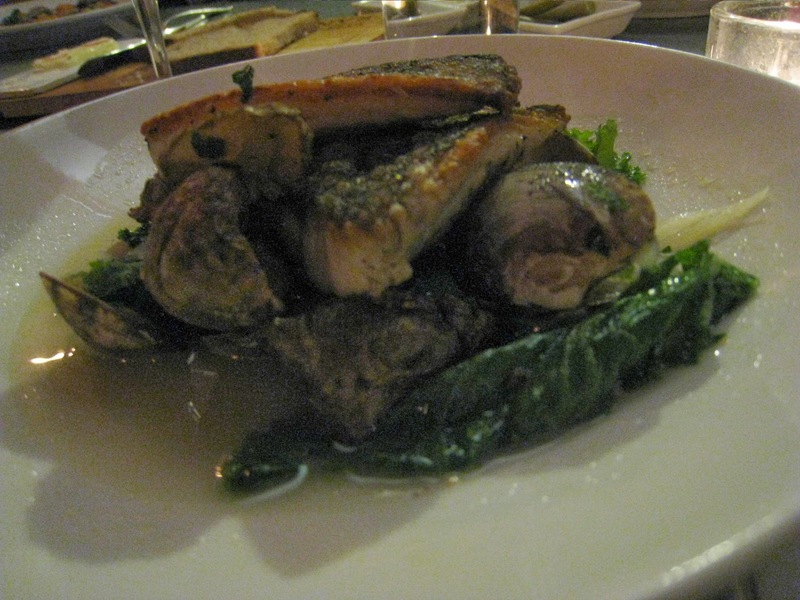 And as for the sea bass - there is a similar dish on the regular tasting menu for $34 - again, at that price I would rather have a nice night out at a place like Beso or Osteria Mozza. We hadn't tried any of the other three entrees on the dineLA menu, they may be perfect, but we can't speak to it, that would be something for others to take a chance on! Grand prize: Prize Pack including $4,500 cash and collection of Food Network Chef Cookbooks. Limit one (1) online entry per person per day. Open to lawful permanent residents of the 50 United States or the District of Columbia 18 years of age or older. See Official Rules for details. Check out the Sweepstakes Page "Win Your Next Bite" - for more delectable promotions! Every dish I've ever had at Petrossian, I've fallen in love with, and end up dreaming of until the next time I am fortunate enough to re-encounter its perfection. Perhaps I am a little biased, as Petrossian happens to offer EVERY ingredient that I love most in the world: caviar (and more caviar), foie gras, truffle (both fungal and chocolate varieties), all kinds of shellfish, and lots of cream. "Foodie mentor" introduced me to the place a while ago, during another dineLA restaurant week - and I had a Foie Gras with Haricots Verts Salad soaked in truffle vinaigrette that I will never forget, Handcut Steak Tartare layered with caviar, and the creamiest panna cotta for dessert. It was one of the most amazing meals I had ever had in LA, and definitely the best dineLA deal by far that year. Petrossian again offered perhaps the most exciting menu on the dineLA list this year, and we were excited to see Steak Tartare as an appetizer - the amazing texture and tastes still lingered in our minds and palates from the last time we had this dish. I couldn't wait to break my rule of maximizing my limited resources on new experiences - I absolutely had to have this dish again. Throwing all thoughts of calories out the window (one reason I love eating with Foodie Mentor so much!!!) we choose to 'prep' for our meal with an additional 'pre-starter' off the regular menu, thanks to our server's irresistible description: listed simply as "Chips and Dip - caviar dip and sweet & purple potato chips" on the menu, she explained that the dip was made of creme fraiche and mascarpone cheese, topped with clusters of caviar and strewn with finely diced red onion. It was every bit as amazing as it sounded, with the rich but not overly dense creaminess of the ever so slightly sweet dip tempered by the subtly salty orbs of caviar, which is then counterbalanced by the crunch and blasts of intense flavor from the red onion. The dip was amazing with the sweet and purple potato chips - which tasted fresh and were at the perfect thickness / crispiness. If only the chips could have been bigger in size to provide more real estate on which to pile on the dip. Otherwise, perfection. Of course, I also had to try the latest and much talked about Petrossian invention, the Caviar-tini ($18). 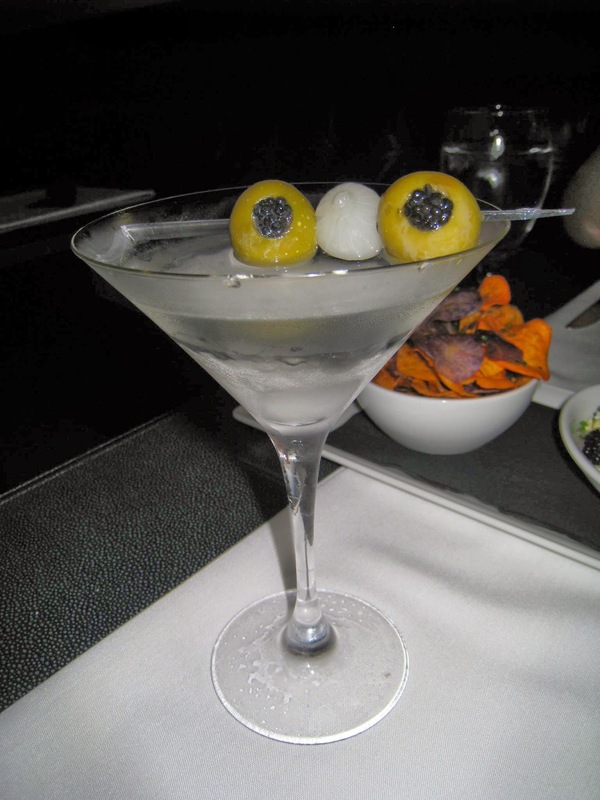 Basically an ice-cold martini served with a skewer of olives stuffed with caviar, and a pickled pearl onion. Utter decadence in concept, and the caviar did add an interesting burst of saltiness to the briny olives. Though it was good, I confess I am not the most sophisticated drinker (normally a fan of cocktails with more pronounced layers of flavor - e.g. Burning Mandarin at Katsuya!) - so this martini was not a personal favorite, especially not with the $18 price tag which was nearly half of the cost of the meal! Onto our 'real' first course from the dineLA menu then. Aside from the steak tartare, the other starters looked good but not life altering - and if you're going to Petrossian, of course go for the dish with caviar or seafood, which is what they are famous for - not the salads (unless there is some amazing ingredient involved - though the Frisee aux Lardons tempted me with bacon and Fourme D'Ambert cheese). The Steak Tartare this year was cut down to first course portion size, and served with a spread of caviar, topped by a fried quail egg. It wasn't what I remembered from last time, as the pieces were not as perfectly sized - everything seemed scaled down - but the texture of the steak was still incredibly smooth and richly infused with flavor. We both went for the same starter - and there wasn't a single piece of meat or solitary egg left on either of our plates. For the main course, Foodie Mentor choose the Caviar Pizza with Creme Fraiche, Chopped Egg, Red Onion, Capers and Chives. That was the first to catch my eye as well, but since we already had the pre-starter with a very similar combination of ingredients, and I knew we could have bites off each other's plate in order to sample more dishes, I considered the remaining choices. Usually a big fan of Pork Belly, that main course looked tempting to me as well - however, keeping in mind Petrossian's signature offering is seafood - and taking a slight risk that the Crab Risotto with Sweet Corn, Mascarpone and Trout Roe might be too sweet, I went with the latter (I do love crab, ikura and mascarpone!). The Crab Risotto turned out to be AMAZING - very creamy, at perfect density, temperature, and evenly infused with flavor. The sweet corn added a slight crunch to break up the creaminess, and the trout roe added bubbles of liquid saltiness that popped pleasantly over the mix and on the palate. ﻿I did not want this fantastic meal to end, but alas, we arrived at our last course. Though I knew I would love the Panna Cotta again, I went for the Caramel Pot de Creme, as this is not usually available on the regular menu. And I couldn't resist another course involving mascarpone, which seemed to be the theme of the evening for me! I loved this dessert, as it was the perfect amount of sweetness, kept skillfully light and served at the ideal portion size, in a cute jam jar with a dollop of mascarpone. The only tiny glitch was there was just a pinch too much sea salt over the top, so that I had one very salty bite. Otherwise, fantastic. Foodie Mentor went with the Pistachio Creme Brulee and liked the new take on the classic French dessert, and that the sugar crust was fairly even. Chic but unpretentious decor - upscale yet laid back cafe ambience in a small, cozy and unintimidating dining room (or choose to eat at either the communal table in the attached store, or outdoor patio seating facing Robertson). No stress parking - though in a central location, close to the Beverly Center, spots are amazingly available for free at meters on the street after 6pm. I found one easily within minutes and just a half block away from the restaurant! Nice after dinner entertainment - checking out all the delicious looking bottles and jars of caviar, tins of foie, packets of smoked salmon and rows of chocolate truffles in the attached store after dinner! Petrossian is definitely one of my favorite places in LA - especially for the awesome deal during dineLA Restaurant Weeks! You have three more days left in this one - GO, maintenant, vite!